Join us December 12 at 6:30 and December 13 & 14 at 5:00 & 7:30 for BCA's holiday classic The Nutcracker. Featuring Blair Chamberlain, Sarah London, Chris Lynn and talented dancers from our Pre-Professional division, this holiday classic includes over 100 performers, lavish sets and costumes, and timeless favorites like Waltz of the Flowers. Tickets range from $10 to $25 and go fast -- call Diana Wortham Theatre at (828) 257-4530 or visit dwtheatre.com to reserve your tickets today. BCA will tour its Nutcracker 2012 to Western Carolina University's Bardo Arts Center (BAC) on Thursday, December 6 at 7:30pm. The BAC is a world-famous architectural gem and the perfect place for BCA to take its sparkling Nutcracker. Tickets are $10 and are available by visiting the Bardo Arts Center website or by calling 828-227-2479. 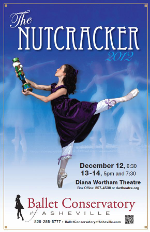 Download the Nutcracker 2012 program. DATES: Thursday, December 6 and Wednesday, Thursday & Friday, December 12-14. Ballet Conservatory’s 'Nutcracker' has quickly become a favorite holiday family tradition. This year's production grows even more magical, featuring newly commissioned scenic drops, a luminous growing tree and an expanded performance schedule. “Reviving ‘Nutcracker’ annually motivates us to create new artistic elements and enhance choreography,” says Angie Lynn, co-choreographer and Ballet Conservatory director. Artists Jimmy O'Neal and Lyle Baskin will collaborate to bring an expanded look to the production, influenced by local mountain terrain and architecture, Victorian to Biltmore. In past years, every performance has sold out, so an extra performance has been added Wednesday night 6:30pm at Diana Wortham Theatre. Expanding also includes touring to Western Carolina University's sizable Bardo Arts Center. It's no small task painting scenic drops 23 feet tall by 45 feet wide. At home with large-scale works, artist Jimmy O'Neal is nationally known for his creative ingenuity and expansive installations, including Hanesbrands Theatre's expansive lobby in Winston-Salem. 'The Nutcracker' is passionately performed by talented professionals among the Conservatory's well-trained corps de ballet. “Our performing fulfills the training process, applying technique learned in daily class, teaching dancers to be expressive in each step and gesture,” says Wayne Burritt, co-choreographer and ballet master. Performance also helps measures progress. Forty of their four-hundred plus students have earned spots in the Pre-Professional division, training in 5-8 classes per week. “As our students develop, we continue to challenge them with varied roles and new choreography,” adds Burritt. “We’ve grown quickly emphasizing excellent ballet training complemented by modern, jazz, and tap,” says Lynn. The curriculum is based on the Russian Vaganova technique, interspersed with the faculty’s own training, like London’s Royal Academy of Dance. Training also includes a summer intensive lasting four to six weeks, five to seven hours a day. “When you put in the time with expert instructors, you clearly improve,” adds Lynn. The “Nutcracker” cast is anchored by Ballet Conservatory’s professional company dancers. Blair Chamberlain, recently with Greensboro Ballet, returns as Sugar Plum Fairy. Sarah London, as Dew Drop Fairy and the alluring Arabian, recently danced the title role in “La Fille mal gardee.” Favorite, Miles Sollars-White dances the Cavalier, returning from his training with Miami City Ballet School. Pre-professional Emma Cory debuts as Clara. Driving by Ballet Conservatory’s Five Points Studios you may view elegant dancers doing what they love, rehearsing the “Nutcracker.” During December, you’ll also see a brilliantly lit holiday forest, reflecting endlessly into studio mirrors. “The holiday feeling fills our rehearsals,” adds Lynn. And well-trained dancer’s spirited performances fill the theatre. No wonder every performance of the Ballet Conservatory’s “Nutcracker” has sold out. TICKETS/INFORMATION: Thursday, December 6 (at Western Carolina University, Bardo Arts Center). Wednesday, December 12 at 6:30pm. Thursday, December 13 and Friday, December 14 at 5:00pm and 7:30pm at Diana Wortham Theatre - box office (828) 257-4530 or dwtheatre.com. Tickets only $10 to $25. Further details and Ballet Conservatory information at (828) 255-5777 or BalletConservatoryofAsheville.com.